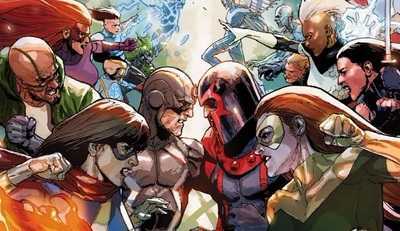 Inhumans vs X-Men #0. Prelude To War. Scott Summers AKA Cyclops of the X-Men went face to face with the Inhuman nation. He died in an attempt to save his race. But things aren’t always as it seems. Shortly after, a truce was forged between the Inhumans and the X-Men. Their only hope for peace is to find a cure for the Terrigen poison and the only ones who can do this are Hank Mccoy aka Beast, formerly X-Men, and Nuhuman Iso. Even though his race is at the brink of extinction, this day, Hank is happy. This threat didn’t come from a super villain or an extra-terrestrial attack. This time, the threat is just science. Hank further explains that there will be no need for war, no need to annex soldiers. Husbands and fathers will not have to leave their families. This time, the problem can be solved with his genius mind and if Queen Medusa speaks true, Nuhuman Iso’s mind also be invaluable. Muir Island, the day is cold and the wind howls like a pack of wolves hungry for flesh. She pays it no mind. Emma Frost lost the love of her life but his ideas will never die. She steps towards the cliff towering 200 feet above the ground. With a click of her timer, she jumps off. Seconds later, the moment before Emma hits the ground, her skin hardens into diamond. The impact explodes the dirt around her. Emma’s mutant power kept her safe. But that wasn’t good enough. She needs to do it again. Returning on top of the cliff, she ponders. The Stephord Sisters heard the noise and saw her stunt. They question her actions but Emma isn’t hiding anything this time. She tells the girls that she needs to trigger her change faster. The girls interject – they warn their leader that what she is doing is dangerous. Well, that’s the point. What better way to train her gift than under that much pressure. Because the next time she goes up against the King of the inhumans, she has to be ready. On board the royal Inhuman vessel, Crystal and her team follows the Terrigen cloud heading towards its next destination. Beast and Iso arrives with a gift. A portable Cerebro is brought on board and it will integrate with Inhuman machines just fine. Now, the inhumans can detect Mutant DNA long before the Cloud hits a populated city. Shortly after Cerebro’s installation, it releases a warning: it detects mutants within the cloud’s vicinity, time to contact: Four minutes. Hank sees the monitor displaying the Cloud heading towards the city. With a quick glimpse he notices that the cloud is shrinking. 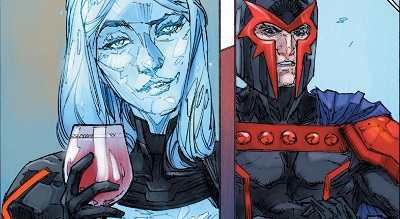 Poland, Magneto and his Uncanny X-Men plays host Emma Frost. She isn’t here for the wine or the view, Emma arrives to discuss the upcoming war. But before they get down to business, Emma requests for Magneto to throw something metallic at her, as fast as he can, without warning. Magneto frowns and tells the girl that it is unwise to request such a thing from the master of Magnetism. Now, to discuss the war – Eric hates the Cloud as much as the next mutant, but the situation is quite sensitive. Eric further explains that their king, black bolt can wipe out his entire team with but a whisper. Karnac can see his teams weak spots and who knows what kind of powers their Nuhumans carry. A dagger wrenches out of its owners hand and flies directly at Emma’s head. It makes contact but breaks into splinters. Emma transforms into her Diamond skin at the last second saving her from certain death. Emma smirks. ‘Thank you Eric’, she says, ‘just what I was looking for’. She continues to tell her unpredictable host that she has a plan to destroy the last Terrigen Cloud. She will have her revenge on the woman who ordered Scott’s death and the man that carried it out. But Frost needs the Master of Magnetism and the monsters who calls him leader. Things must be done, Dark things. And Eric is the darkest man she knows. The savage land, a few months back, Hank discovered that the Terrigen Cloud was shrinking at an unusual rate. There is a chance that parts of the cloud found its way here. He hopes not but it’s better to be safe than sorry. This device will help them find out. Detroit, Emma makes contact with the time displaced X-Men. Iceman, Beast and Cyclops are there to greet her. Emma informs the young team that they, along with their race, are all going to die unless they help her. Hank wants to know the specifics but if it is that dire, than his team is in. Emma got her answers without giving too much away. She will be in touch. New Attilan, Hank Mccoy brings dire news to the queen. He informs Medusa that there isn’t enough time and resources to produce a cure. All things are possible in science, but his faith in his own abilities has been shook. Medusa steps off her throne. She tells her mutant ally that all things are possible, words taken from Hank himself. Minutes later, alone, Hank feels lost. He thought he could save his race but now, he isn’t an X-Men and he is no Inhuman. He is mutant that doesn’t belong to either side. He hears something. Hank snuck back to the throne room only to discover the Queen in a private meeting with her subjects. Not realizing that she is being watched, Medusa informs her royal family that hank failed to find a cure. War is upon them. Another attack will come. Inhumans will not start the fight, but they must be ready to win it. The hellfire club, Emma meets with the clubs new leader. The unseen woman tells Emma that she will have things ready on her end. Hank has two months left to find a cure or a solution to avoid the upcoming war. Whatever happens two months from now, mutants will be ready. New Attilan, Hank is alerted to a signal from the Savage land. Terrigen readings have shot through the roof. It is happening, the endgame is finally here. Limbo, at the last safe refuge for Mutants, Storm receives a phone call along with the unexpected arrival of Emma Frost. Moments later, Frost enters the room. Storm tells the former queen of the hellfire club that she took a phone call from Beast, the older one. Hank has news but he wouldn’t say anything over the phone. He wants to meet with the representative of every mutant group. When asked if Hank sound joyous, Storm replies, no, the opposite actually. Frost scoffs. She now knows that Hank failed. War is here and she is finally ready. ‘Don’t worry, darling’, She states, ‘Emma’s here to save the day’. Whats going on guys welcome to comic island, my name is joey and today we are kicking things off with a little prelude to the big X-Men event of 2016. Since this is issue 0, it can be skipped without harm to the overall story arc but since I love to do things in continuity, I thought I would add issue 0 to my overall coverage of this event. So let’s go through what stood out for me in this issue. I love this little part where they address what motivates the Inhumans, or rather, the inhuman royal family. This Terrigen mist is sacred to them and the core family will protect it with their lives. These Nuhumans are, well, new so they don’t have much stake in the well-being of the mist. I would like to see marvel address this a bit more because there are quite a few Nuhumans in this Inhuman roster. The more we know about these Nuhumans, the more we will be able to bond with them and start to see what they see. But that is an uphill battle for Marvel. The next thing I love about this issue is the knife scene with Magneto. Emma urges him on to strike her with something metallic but he doesn’t do anything till she provokes him. That is the badass Magneto I miss and wanna see more of. I adored this scene. Hank Mccoy stands out in this issue as well. The very first page introducing the characters shows the Beast dead in the center between the two races. If Marvel does this right then I can see the Beast becoming a core character in this story arc, much like Spiderman during the first civil war. The one thing that confuses me about this issue is the scene when Emma goes to the Hellfire Club. Emma meets with someone from the club, whom I assume is the new leader, aka the Queen. Last time I checked, the king was Kade Kilgore. The only person I think it could be is Selene. If you think you know, please let me know.